As is the case in many magical universes, names have great power in the science of living things – especially organic chemistry. Chemistry is a science full of mystical potions, strange reactions, and powerful compounds. Only the bravest of wizards – er, scientists – are willing to risk the hazards of flammable gasses, explosive metals, and toxic crystals to uncover the mysteries of life. In this wild world of modern alchemy, there is but once force standing between the chemist and utter chaos: the system of nomenclature developed by the grizzled and esteemed members of IUPAC, the International Union of Pure and Applied Chemistry, whose members have been granted the power to decide such things. These honorable Namers teach us that to know the true name of a thing is to understand its essence, to know its fundamental elements, and to see its place in the world. Skilled Namers can see the true forms of the mysteries before them and, naming them, bend them to their purpose. This power is not to be taken lightly, for even the most common word may wield forgotten power – or, at the very least, help you understand the ingredients list on your breakfast cereal. Should you choose to become a student of the mysteries of life, immerse yourself in the teachings of the legendary Namer Dr. Laurie Starkey… or review the overview ahead. 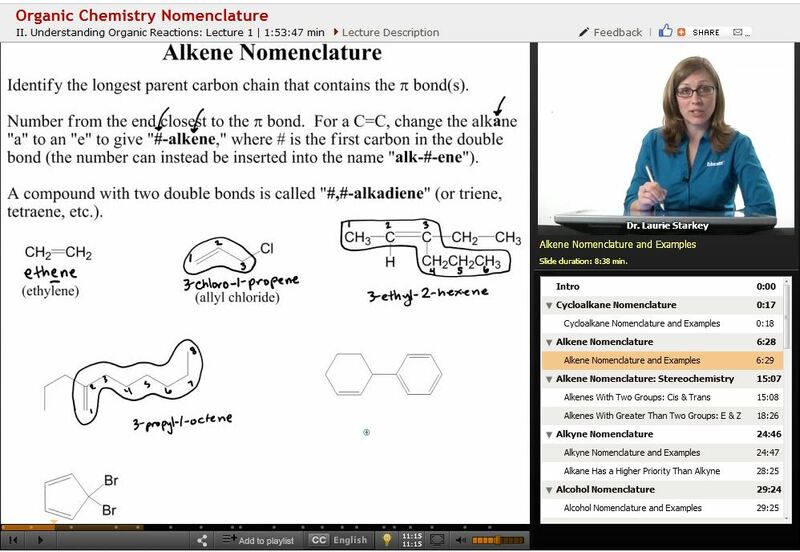 Cycloalkanes, alkenes, and alkynes are all named according to the rules for alkanes as described before with a few modifications. Cycloalkanes have the prefix cyclo-, and substituents are numbered according to which carbon they are attached to. The carbon with the most groups or the one that comes first alphabetically is set as number 1, and the rest are numbered accordingly. In cyclic compounds, naming continues clockwise or counter-clockwise, whichever results in the lowest numbers. Alkenes (carbon-carbon double bonds in a structure) and alkynes (triple bonds) are named with the -ene or -yne suffix, with a number prefix that tells which carbon is the first one of the double or triple bond. Alkenes can be cis or trans if substituents are on the same or opposite side of the double bond, while the prefixes E- and Z- are used if there are more than two substituents. Ethers and alcohols contain one of the most powerful elements on earth: oxygen. Ethers have an oxygen between two carbon groups, while alcohols have an OH group somewhere on the chain. Alcohols have the -ol suffix, such as methanol, ethanol, or propanol. If there are two OH groups, it is a diol, and if the OH group is not a the end of the chain, it can be numbered to indicate its position (e.g. 1,4 pentane diol). 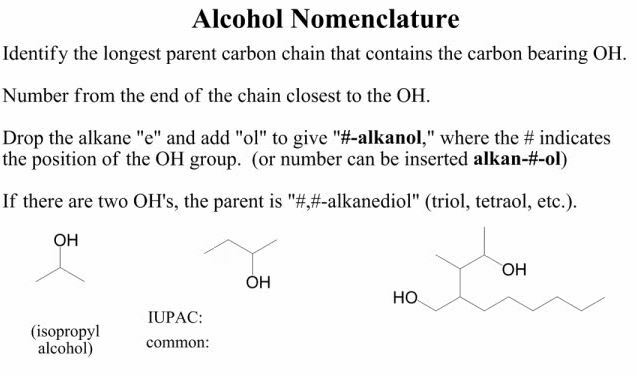 Lastly, alcohol groups come before alkenes or alkynes when naming long structures and are called “hydroxy” groups. Ethers do not change the suffix of the molecule and are always named as substituents. The shorter group attached to the O is given the suffix “-oxy,” as in the compound ethoxyethane. 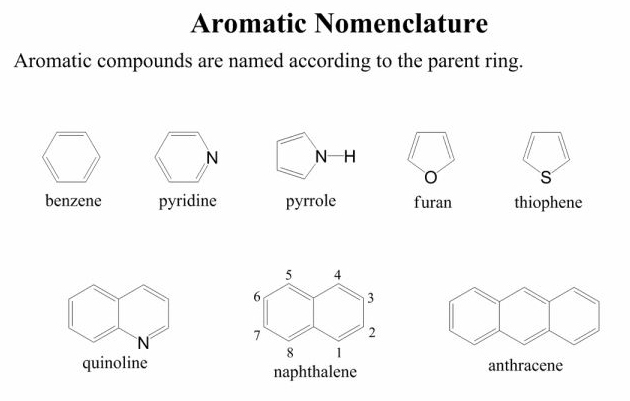 Many of these compounds have less complicated common names, so it is important to note which ones are common and which ones are officially sanctioned by IUPAC. Nitrogen, the inert ingredient in our atmosphere that prevents oxygen from constantly setting everything on fire, can be used in organic molecules to create amines such as ethanamine, and 1-propanamine. If the nitrogen is not simply an NH2 group but has additional substituents, it can be described using an N, as in N-ethyl-1-propanamine, with the longest chain acting as the parent chain. Compounds with a carbon double-bonded to an oxygen are called carbonyls. If they have an alkane on one side and a hydrogen on the other, they are called aldehydes. The carbonyl carbon is always denoted carbon 1, and the molecule is given the suffix –al. one of the most common aldehydes, formaldehyde, is officially named methanal because it is a methane derivative. Ketones have alkyl groups on both sides of the carbonyl group and have the suffix -one. The parent group is the longest chain containing the carbonyl, and it is named so that the carbonyl group has the lowest number. Acetone, commonly found in nail polish remover, is a propane (3-carbon chain) derivative and would officially be known as 2-propanone. Compounds with benzene rings always use benzene as the parent group. When there are only two substituents, they can be identified as ortho- (next to each other), meta- (separated by one carbon), or para- (separated by two carbons) relative to each other. With three or more substituents or a heteroatom replacing one of the carbons in the ring, the numbered naming comes back into effect. When a carbonyl group has an alcohol group directly adjacent, the hydrogen on the alcohol will be acidic, so the compound is called a carboxylic acid. The carbonyl carbon will automatically be carbon 1, and the compound will have -oic as the suffix followed by “acid.” Acetic acid, the acidic component in vinegar, would be known as ethanoic acid as it has a two-carbon chain. Its derivatives include acid halides, anhydrides, esters, carboxylate salts, amides, and nitriles, all of which have their own nomenclatures. Once you’ve learned the fundamentals of chemistry terminology and have practiced applying them (check out the Organic Chemistry course & lecture for numerous examples and possible combinations), you’ll be ready to meet even the most terrifying of organic molecules… and interpret every last chemical name on the ingredient list of your favorite snack. But use your power new-found power wisely, lest the venerable leaders of IUPAC find you violating the order of the Naming world!